Dress - Katie & Paul's Big Day! I wasn't looking to spend a small fortune on a dress. As tempting as it is to go to Kleinfeld's in New York and possibly get on SYTD, I opted to go to David's Bridal. I loved this dress online and I loved it even more when I tried it on. 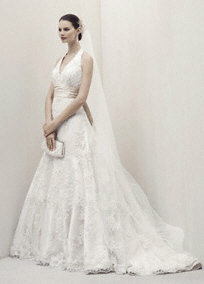 The dress is Oleg Cassini All Over Lace A-Line Gown with Obi Sash Style CWG365.